Casa Maravilla in Sayulita - loosely translates to "Wonderful House" and it is. It's a circular design with surprises at every view. In Sayulita’s best location, it is only a block and a half from the beach and 10 minute walk to town. The lowest level is entered separately from the rest of the house and consists of an air conditioned bedroom (a king bed that may be converted for use as two twins), with a half bath in the utility area and an outdoor shower with cold water only. To enter the main levels of the house, there is a half flight of exterior stairs that leads to the main level entry. Wi-fi is not available in this bedroom, but is everywhere else in the house including rooftop palapa. This bedroom would not be suitable for young children to sleep in by themselves. Up a flight of stairs is the living/dining/kitchen area. There is dining for 10 at the two tables, a well appointed kitchen, two couches and a nice full bathroom with shower. Also on this level is a terrace with a view of the ocean over the coconut palms. The house design is pretty amazing - it's shady, cool, and breezy - and ceiling fans are everywhere, in addition to the air conditioned bedrooms. Then on the rooftop floor is a living area with really large banca, additional dining, a water closet in the pool pump room, and a small pool. All of this is covered by a beautiful and dramatic palapa. Night times are especially magical up on the roof. The pool’s about chest high - 10 or so in diameter - and great for relaxing, cooling off in the Summer, and whatever. The views on this level are pretty terrific - jungle, ocean, lovely neighborhood, etc. Casa Maravilla in Sayulita was amazing. Super helpful host & house manager, could not have asked for a better place to stay in lovely Sayulita! Definitely recommended for small groups of friends/family. Casa Maravilla was amazing. It was an interesting, warm, artistic home with everything you could ask for. Mitch (Property Manager) was PHENOMENAL and he lives right next door, which is convenient. Thank you so much, Michael and Angela. We so enjoyed staying at your amazing home. You were so responsive and thorough in our correspondences and inquiries. The house was so well built and beautiful with so much thoughtful arrangements, caring, and consideration. We loved the art work! The house had the excellent design to stay cool - we did not need to use the A/C, which was so nice. The breakfast and dinner at the top floor looking over the palm trees and ocean in the distance were unexpected gifts. The bedrooms were surrounded by the trees and bamboos. I loved to watch the colorful birds in the trees. Two blocks to the beach. Two blocks to several restaurants. Safe and nice neighborhood. On Saturday, there was a neighborhood party with loud music at night, but the rest of nights were very quiet. I highly recommend this wonderful place. Casa Maravilla in Sayulita was precisely as described. It was perfect and we would go again in a heartbeat. The neighborhood was good and we felt very safe. We went with our 2 grown sons and 1 of their girlfriends and it worked out very well. Michael provided all of the information that we needed and the house was set up very well for our trip. The house manager was better than any other and the house cleaner did everything she could to make the house clean and comfortable. There was nothing missing-- towels, safe, great kitchen. A beautiful place that we will always remember and think fondly of. Great vacation spot! What a beautiful house! Michael, you have a jewel here! We have seen such a variety of wildlife, and such a tranquil spot with great food. This place definitely rates a return visit. Thanks for a memory. What a fabulous vacation. Thank you for opening your house to us. We had many wonderful meals in the kitchen, and many lazy afternoons by the pool. It was exciting to watch our little girl learn to swim in the pool…After a night out on the town it was so wonderful to come back to your comfortable home. Casa Maravilla was AMAZING! We could not have asked for a better location and or a better house. The secluded area of the house was peaceful and relaxing yet very convenient to common areas, including the beach. We have traveled to Sayulita quite a bit and this is by far the best place we have stayed! 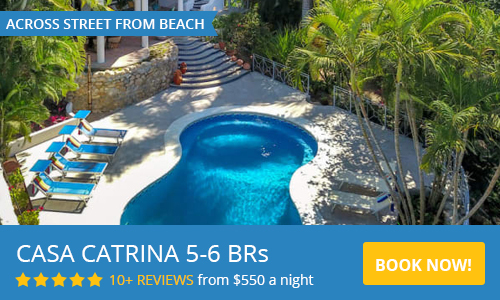 This will be our go-to place to stay in Sayulita! Que Bonita! Our first trip to Sayulita won’t be our last and I know where we’ll be staying from now on – Casa Maravilla has it all: pool, shade, quiet, hidden in the trees, great views and a wonderful rooftop palapa. We loved the house and location. Perfect really. Love the curvy design - pleasant breezes in every room. What wonderful architecture. And loved the mornings on the roof deck watching all the birds. Such a special home. We came to Sayulita for a wedding and were the envy of all our friends once they saw our amazing accommodations. This place is wonderful. Credit Card processed by paypal. Or bank to bank by Zelle. House limit is 6 people (includes adults and children) and a one baby. High Season - January 6 thru April 27 except special holiday weeks noted below. $2000 per week or $350/night if less than a week. 3 night minimum. If your stay includes days that are in more than one rate category, amount due is prorated to take different price levels into account. *Rates include light daily maid service each day except Sunday and Holidays. Terms: 50% Upon making reservation. Balance is due 30 days prior to your visit. Payments by: Pay Pal or Credit Card or Zelle. We have a six person house limit, plus one small child. Casa Maravilla is a "no smoking" house. Management - Mitch moved from San Francisco to Sayulita several years ago. He is very knowledgable about the area and will help you with any concerns during your stay.